The Agagu episode was not a mystery as such but something like it. 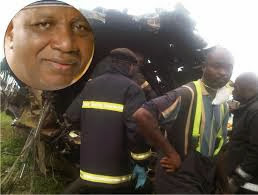 A dead man Olusegun Agagu was enclosed in a casket of gold with all his vanished accomplishments – former governor of Ondo State, former chieftain of Peoples Democratic Party (PDP), former Minister of this and that, Dr this. Chief that, ex- His Excellency etc. 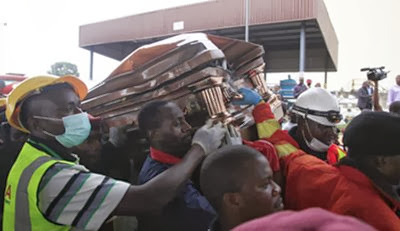 His corpse was on the way to its final resting place in Iju Odo in Ondo State. The man in the small metal box was isolated in the belly of the plane while others were seated in the cabin. The man could no longer sit with the living among whom were my good friend, Tunji Okusanya (Snr) a.k.a. Rector, his son, Tunji (Jnr) and other people of mixed importance. In less than two minutes of take-off, the plane crashed and closed the gap between the living and the dead. The accident was a dramatic illustration of the dead burying the dead. When Jesus said, ‘Let the dead bury their dead’, it was not a parable. It was a poetic mockery of mortal humanity. He saw no difference between the dead and the living. What separates them is time and space of tenuous insignificance. One sleeps in perpetuity while the other functions in the chaos and ructions of human existence. For one, the politics of life has ended. For the other, he skedaddles with death in the politics of hide and seek. When mourners and undertakers assemble for the funeral of a departed one at a cemetery, their posturing and pretensions notwithstanding, they are flirting with the rehearsal of their own funeral. The difference is in time and space; one sleeps that day, others will come to sleep on other days. The cemetery gate is the metaphor of life and death; the barrier between the dead on the other side and the dead on this side. While some dead are sleeping in the graves in the cemetery, the other category of “the dead” (the living) are on long-queues outside the cemetery gate uncertain of whose turn is next. The dead in the graves are the ones that have been eternally denied the right of redress and corrective privilege for all their actions when they were outside the cemetery. But those at the gate are the living that still have the privilege of correction. The stories of those inside the cemetery have sufficient lessons for those outside it. But very foolishly, many who are still outside the gate will still go inside the cemetery with the same blunders committed by those within believing that eternity is nothing but a fantasy promoted by those seeking recompense for their perceived self-righteousness. The circumstances of the literal narrative of the accident excite me just as its figurative dramatisation. A spiritual rhapsody was introduced to the narrative when Dr. Kayode Fayemi of Ekiti State urged all Nigerians to intensify their prayers as a way of cleansing our nation of all its profanities and iniquities. He made the call when he paid a condolence visit to his bereaved Ondo State counterpart, Dr. Olusegun Mimiko. Fayemi’s prayer alert is troubling. Of all the countries of the world, Nigeria appears to be the one with the highest number of churches, pastors and prophets who are very very close to government and political leaders. Even if I don’t know what goes on in other churches, I know that in my own church, prayers are always said for Nigeria during some of these special programmes. If all these prayers are still to be intensified as Fayemi suggested, it shows that most of our churches have either not been praying for the country, or have not been sincere in their prayers, or that GOD is not accepting our prayers for one reason or the other. Countries all over the world had been granted autonomy by GOD to run their affairs but here in Nigeria, we keep showing our incapability to manage our affairs ourselves. We bother GOD for virtually everything that other countries have taken for granted. We organize vigils, special prayers and even visit prophets before we take a flight, before we travel from one part of the country to the other, we pray to get jobs, we pray before writing exams, we pray to get contracts, we pray before attending political meetings/rallies, before our children go for national service, we pray not to be victims of Boko Haram, kidnappers and ritual killers. Even simple thing like eating also requires prayer otherwise… we pray when our drivers take our children to school and pick them from school, we pray before we sleep. With all this list of ‘befores’ coming from Nigeria alone when will GOD rest? Our post-tragedy attitude reveals one thing – human existence is a puzzler. As soon as a tragedy occurs, we cry, we shout, we moan, we mourn and we grieve. Afterwards, I mean in a very short period, we begin to laugh, we rejoice, we frolic, we enjoy, we razzle and continue with life as if nothing had happened. The one that is dead is the one that is doomed. This is why I think government attitude to tragedies is spiteful. It is convenient for the government to deal with tragedy in a casual manner because Nigeria is one nation where tragedies are on queue. As soon as one erupts, the next on the queue allows just some few days of hoopla before it takes it own turn and it does not take time at all. If the government is therefore overwhelmed with tragedies and lacks the capacity to prevent them, it is because we have allowed tragedies to become a routine occurrence hence death no longer shocks us. Besides, government’s strategy in the management of tragedy needs some elevation. Making predictable moves all the time does no credit to its creative capacity. Immediately the tragedy occurred, I was expecting government to set up a panel to investigate the cause or causes of the crash. And it did. Yes, it may be the natural action to take but my concern is that the country is becoming notorious for its festivals of probe. The death of a dead man is far-fetched, eldritch, curious and preternatural. Methinks we are exaggerating the fatality of death knowing that nobody dies twice. Everyman, whether in a casket or in a mansion, dies once. When therefore a corpse in a casket, on its way to its final resting place, is assaulted again by death, such bizarre attack is misplaced venom from the one that has the final encounter with everyone that carries the flesh of sin. This second death is nothing but an evil expression from the one that is proud of the superfluity of its sting. Otherwise, why waste your sting on a man that is already gone? The riddle lies in the multitude of victims that became the casualties of the cabbalistic fellowship between death and its evil accessories that were engaged in a conspiracy of revenge over covenant breach. Agreed that death is the conclusion of life’s vanity and the finality of the unrewarding labour of man on earth but why must another man depart consequent upon the unfaithfulness of the other to the obligations of his covenant? Why did GOD allow a collateral damage of the innocent in the crossfire between death and the brotherhood. The Christians are not wrong when they refer to GOD as unquestionable. What then is the point of engaging GOD in a dialogue that will end in rhetoric? I therefore submit myself to a mystery I can NEVER unravel. I think his cult took 15 people to sacrifice his death. I lv diz write up sir…….I celebrate u…….. Try to go through d write up again,read it from your heart,it’s powerful write up. Dis must be a plan wk? In whatever position you find yourself,please give thanks to God.See the rich who cannot travel from just Lagos to Akure which is almost treckable.But they dont bother to fix the bad roads simply because they dont ply on them.Their only safest means of traveling(not even on public aircraft but a chattered one) is what is killing them.Poor nigerians who cannot afford to travel by air,may God continue to grant us journey mercies! indeed, God will cont to grant us journey mercies.Dis writeup is sometin evryone shld meditate on.keep it up sir, i luv it. Preach on preacher-Dappy, I respect you o. Infact, I bow down for the anointing upon you. Honestly, you cracked me in a way that almost reap apart my ribs. I have not been cracked loudly with laughter in a long time brother. You need to start a church. Definitely, you will be a blessing to many through the wisdom of God upon you. I enjoy this article so much I promised to copy it for my achieve. I love dis write -up. I just feel like reading it over and over again. U r just 2 good.